This homemade macaroni and cheese is a great alternative to the boxed version—and you can pronounce all of the ingredients. Laced with a blend of cheeses and enriched with milk and cream, even grown-up guests tend to sigh with pleasure while looking at it. The browned panko crust sits atop a bubbling casserole of cavatelli pasta nestled in a sauce fragrant with a mixture of Gruyère and cheddar cheeses. Although you can call it macaroni and cheese, the actual pasta shape is up for grabs. It’s hard to think of a single dish with more universal kid appeal and many kids like boxed macaroni and cheese, but this version will tempt them away from it. The Dijon mustard and red pepper flakes give the macaroni and cheese a little kick, a little edge, and save the dish from being too intensely rich and creamy (not that there’s anything wrong with that). 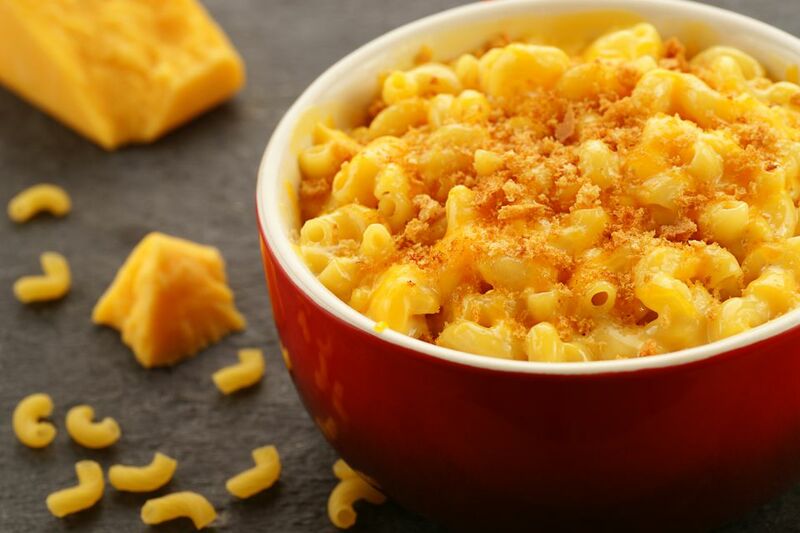 Note: while there are multiple steps to this recipe, this macaroni and cheese recipe is broken down into workable categories to help you better plan for preparation and cooking. In a small saucepan over low heat, melt 3 tablespoons butter. Or, place it in a medium-size microwave-safe dish and heat it until melted, about 15 seconds. Add the panko and the Parmesan to the melted butter and stir until well combined. Set the panko topping aside. Bring a large pot of water to a boil, salt it generously, and let the water return to a boil. Meanwhile, in a large heavy saucepan over medium heat, melt 4 tablespoons butter. Whisk in the flour and optional red pepper flakes. Cook, stirring, until the flour is blond in color, about 4 minutes. Gradually whisk in the milk. Increase the heat to medium-high and let the sauce come to a simmer, whisking frequently. Reduce the heat to medium-low and let the sauce simmer for about 5 minutes or until it starts to thicken. Add the cream, grated cheese, Parmesan, mustard, salt, and black pepper, stirring until everything is smooth. Taste for seasoning, adding more salt and/or black pepper as necessary. Add the pasta to the boiling water and cook it until barely al dente (follow the package directions but stop a minute or two before the pasta is completely tender). Set aside 1 cup of the pasta cooking water, then drain the pasta. Whisk the reserved pasta cooking water into the cheese sauce, combining it thoroughly. Add the pasta to the cheese sauce and stir to combine. Heat the oven to 400 F. Butter a shallow 4-quart baking dish. Spoon the pasta mixture into the prepared baking dish. There will appear to be a lot of sauce but not to worry. Some of it will be absorbed into the pasta as it cooks, and saucy is better than dry. Place the baking dish on a sheet pan to catch any drips and sprinkle the panko topping evenly over the pasta. Bake it until golden and bubbling, 30 to 40 minutes. Remove the pasta from the oven. Let it sit for a few minutes. Serve hot. Some good basic cheeses to start with are sharp or extra-sharp cheddar, Gruyère, Swiss, Manchego, and fontina, or any combination of these. If you have some small pieces of softer cheeses, like Brie or fresh, mild goat cheese, lingering about, use them. Remove all rinds you wouldn’t want to see floating around in your mac and cheese and, unless you really know your audience, stay away from very potent cheeses like blue cheese or smoked cheese or anything particularly stinky. Meatball Sub Sandwich Recipe, Made with Frozen Meatballs!